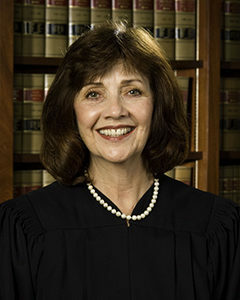 Justice Haller was appointed by the Supreme Court as a CJEO member in 2013. She began her judicial career in 1989 at the San Diego County Superior Court where she served on assignment as an independent calendar judge and as a member of the court’s executive committee. Justice Haller was appointed to the Fourth District Court of Appeal, Division One, in 1994. She has been active in judicial ethics as the chair and vice-chair of the California Judges Association ethics committee and as a special master for the Commission on Judicial Performance. Justice Haller received the Bernard E. Witkin, Esq., Award in 2003 from the Law Library Justice Foundation of San Diego County for civic leadership and excellence in teaching and adjudicating the law. She received the Joan Dempsey Klein Distinguished Jurist Award in 2004 from California Women Lawyers for excellence as a jurist, commitment to gender equity and the elimination of gender bias in the legal profession, and service as a role model and an inspiration to women lawyers.